Parallel processing of digitised content in different task queues. The digitisation process involves coordinating and working through a wide range of tasks such as OCR, long-term archiving, image conversion and validation. The intranda TaskManager (ITM) displays and manages key information about current tasks within the digitisation process. Equipped with a host of superb and extremely handy functions, it is designed to help you save time and deal more efficiently with the individual tasks that make up the digitisation workflow. Although OCR is without doubt one of the most important jobs coordinated by the intranda TaskManager, the program can also be used to handle many other jobs. Until recently, TaskManager used to place different types of task one after another in the same queue and work through them in order. Unfortunately, this often meant that they slowed each other down, and many processes were held back unnecessarily. Following the introduction of intranda TaskManager 2.0, different types of task are now separated into different queues. Instead of slowing each other down, they can be processed quickly and efficiently. Highly CPU-intensive tasks such as audio and video conversion can now be clustered across a number of systems to speed up processing even further. When it came to developing TaskManager 2.0, we also focused particularly on the graphical user interface (GUI). The new GUI gives a much better overview and allows for easier navigation in your day-to-day work. As well as giving the program a design makeover, our developers have enhanced its functionality. In short, we have ‘repackaged’ TaskManager 2.0 and brought together all the main administrative functions in a clear and intuitive interface. The various workflow tasks are now displayed and managed directly through the menu system in the GUI. Each is clearly allocated to a particular type and can be prioritised, paused and even cancelled by the administrator. The ability to cancel or change the sequence of tasks in each queue allows for much more efficient processing, with the result that you can monitor your progress accurately and make improvements as required. You can also display a range of diagrams in the GUI, e.g. showing your OCR usage. The GUI has been programmed in HTML5 with CSS3 in order to support as many screen sizes as possible – from high-resolution widescreen monitors through to much smaller screens on mobile devices. 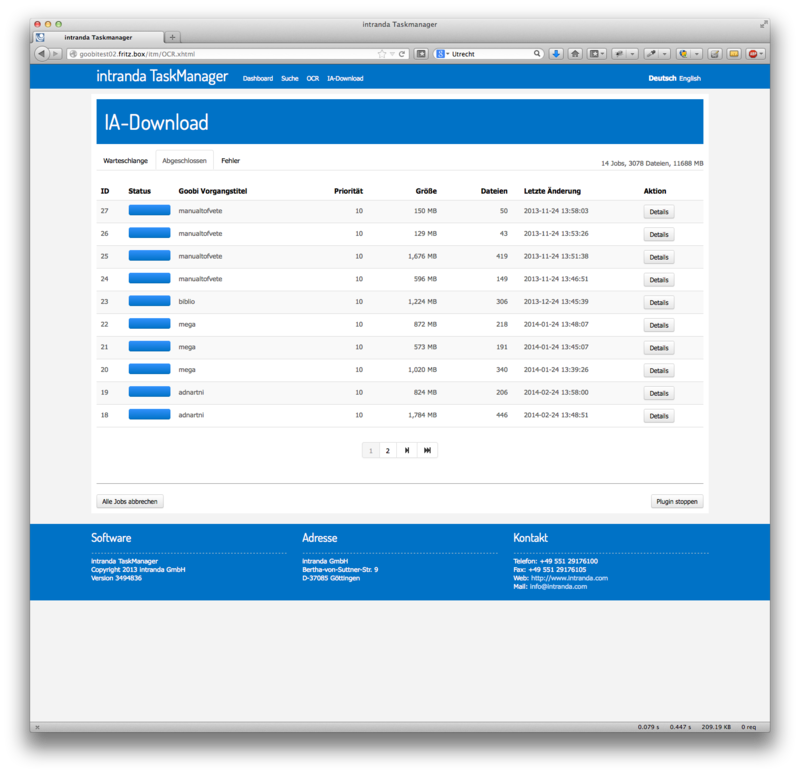 Although for most digitisation projects the intranda TaskManager is bolted onto Goobi, it can be used on its own and receive tasks from other programs. For example, the intranda TaskManager can be used to coordinate and work through large-scale OCR and other jobs independently of Goobi. 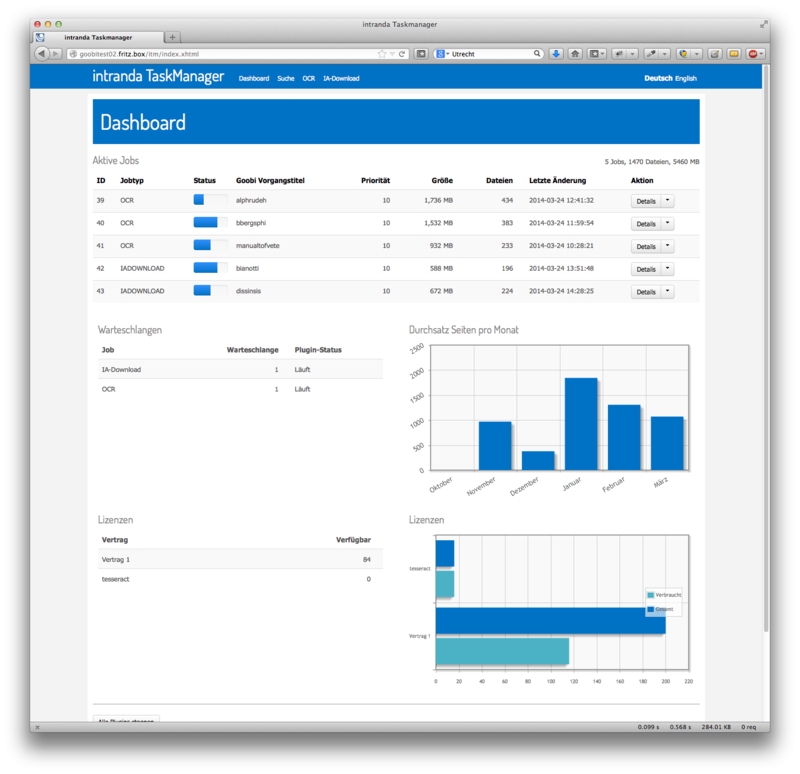 TaskManager 2.0 was specifically designed by intranda to allow for flexible expansion. All the queues and tasks are based on a plugin system that means you can add new types of task at any time. The latest version of TaskManager comes with a host of new functions and potential extensions. The following list contains just some of the new functions. Different types of task are now separated into different queues. Image conversion to JPEG2000 with a range of converters. Accurate page statistics and transparent billing system.